Cody Garbrandt can’t understand why USADA can’t re-test T.J. Dillashaw past drug samples. 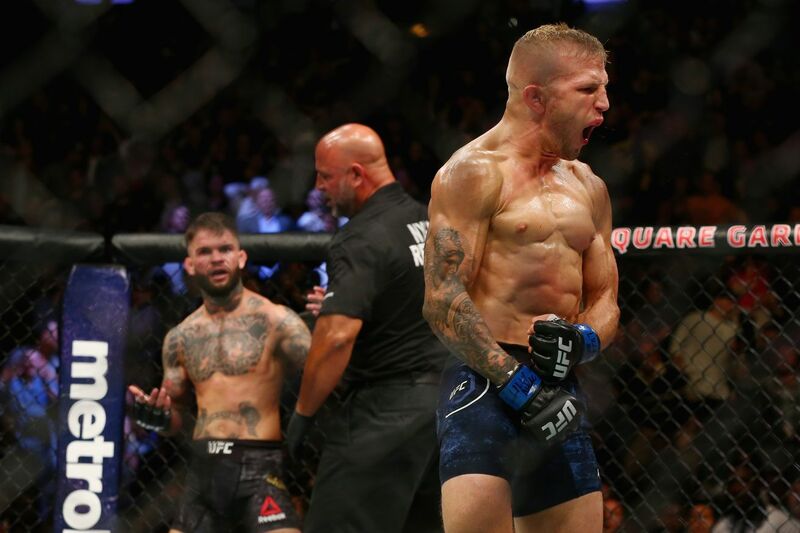 T.J. Dillashaw tested positive for EPO in relation to his flyweight title bout with Henry Cejudo at UFC Fight Night 143, but many fighters suspect the former two-time bantamweight champion has been using performance-enhancing drugs for most of his career. In fact, back in 2018, former teammate turned arch rival Cody Garbrandt specifically accused Dillashaw of using EPO, and the Team Alpha Male product has demanded that the United States Anti-Doping Agency (USADA) go back and re-analyze TJ’s previous samples for the same substance. According to ‘No Love’, though, USADA can’t re-test the samples because they don’t have enough money. “I asked for more strict drug testing when I was slated to fight TJ, even said what he was on and it still went untested. Now USADA is saying they can’t go back on the frozen piss cause they didn’t have the money to store it?” Garbrandt posted on Twitter on Thursday. USADA hasn’t publicly commented on whether they can re-test Dillashaw’s previous samples or whether or not those urine samples are still in their lab. Garbrandt is obviously looking to have both his losses overturned to No Contests, as the 27-year-old suffered two of the worst defeats of his career to Dillashaw in 2017/2018, suffering back-to-back knockout losses at UFC 217 and UFC 227. The former 135-pound champ was also recently knocked out by Pedro Munhoz at UFC 235. Former UFC ‘champ-champ’ Conor McGregor believes Garbrandt is ‘clean and unbeaten’ following Dillashaw’s positive test for EPO.